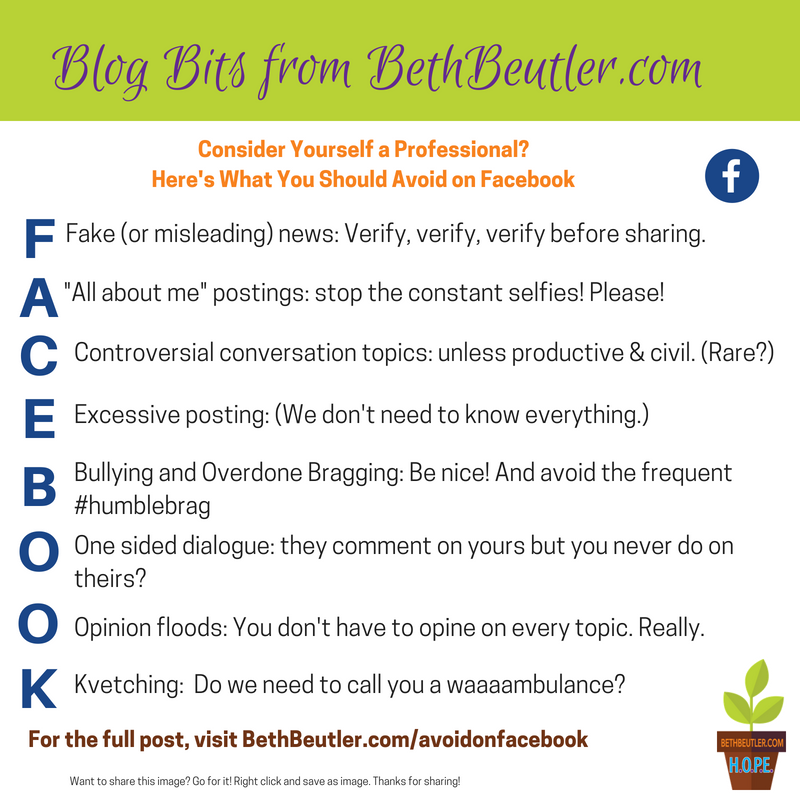 But if you’re part of the 2.13 billion users out there, here are eight things an excellent professional should avoid doing on Facebook. You’ve seen accounts where 90% or more of the postings are all about the person–what they’re eating, where they’re traveling, what they’re wearing, what they’re opinion is on all the topics. To be fair, Facebook/Instagram pages are a person’s platform…they can do what they want with them and I don’t have to follow. And for some, “personal branding” is part of their profession, so putting themselves in the picture a lot might be logical (even if it is annoying.) But a tip–if all you post are “all about me” photos, and more than 75% of your postings are selfies, be aware that regardless of your profession, you may come across as one-dimensional. Mix it up! Show us some scenery. Share a thought-provoking question. Mention other aspects of your life than just your business or children. This goes along with fake news, but in general, controversial topics that are not productive or civil should be avoided. The likelihood of changing anyone’s mind because of a Facebook/Instagram posting is pretty slim. I’m not saying you should never give your opinion. But if you do, have a good reason why, and be winsome in how you do it. You’ll go a lot farther with people by having a decent, civil conversation and meaningful discussion rather than just posting a screaming opinion about a controversial topic. 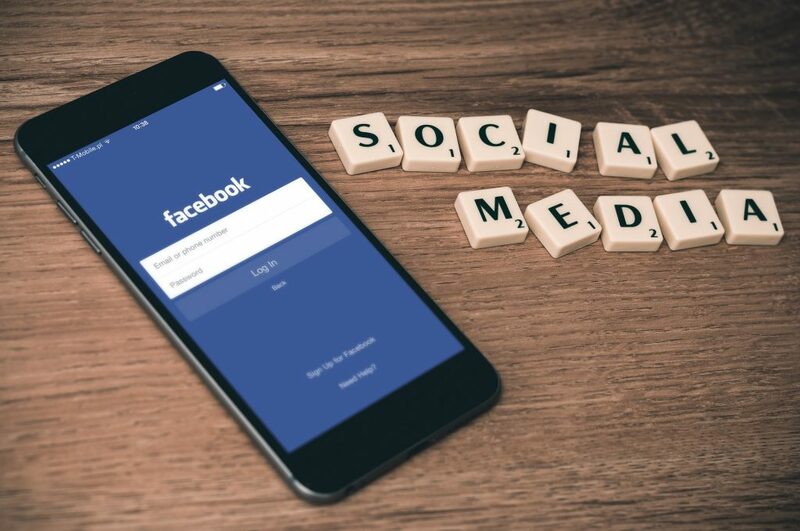 It’s tricky to decide how much you should post, and how often, particularly if you are promoting a business as part of your overall life. Some of us fall into the trap of posting every day or multiple times a day. It might be best to re-think that. Excessive posting can make your shares feel too familiar, and wearying to your friends and followers. If you feel the need to post frequently, or just enjoy doing so, consider incorporating Instagram stories (which connect to Facebook messenger) instead. Because these reside outside the main feed, people can choose whether to watch them or not. This SHOULD go without saying, but throwing insults and abusive words from behind the safety of a screen is unacceptable and cowardly. If you must correct someone, be gentle, and gracious. Assume the best. And, if you notice a mean-spirited post by someone who has the reputation of being kind, give them the benefit of the doubt. They may have been hacked. Let them know privately so they can correct it! As for bragging, it’s so easy to do on Facebook. It’s particularly challenging for those of us who run a business. It’s logical to promote what we do, and show what trust others may have placed in us, or some publicity we may have received. The “#humblebrag” of “I’m so honored to be named one of the best” is a common thing. I find this one tricky and simply suggest we be aware of how often we bring attention to ourselves. Ask if it’s necessary to do so on a regular basis, or if perhaps we can just season our posts with it occasionally. Some users have a habit of posting what they want to say, but rarely engage with their friends who are faithful to follow their posts. It gets old to respond or read someone’s feed, but notice that they rarely reciprocate by commenting on anything you post. Have a conversation–don’t just give speeches. Other people enjoy engagement on their posts, too. Social media has opened the door for anyone to have a platform. Picture if the same thing was happening on every street corner in your city. There’s someone using a megaphone to share his/her opinion on any number of topics. For the first block or so, it could be an interesting walk. But after a mile or so, wouldn’t you want to cover your ears? The world does not need your opinion on every matter. Choose to stay silent about some topics. Pick and choose what would bring value to others. We don’t hear this word often anymore, but it fits the acrostic well. Kvetching is complaining. We’ve all done it. Whined about the weather, or some politician, or poor service. No need to avoid truthful negatives occasionally, but it’s easy to fall into the “Woe is me, give me attention” syndrome on Facebook. We desperately want those “likes” or sympathetic comments. But after awhile, readers are thinking, “Here she goes again” or “#firstworldproblems.” I recommend that at least 80% of your posts be positive, or at least neutral (no one wants constant sugary posts either), and that you reserve 20% or less for the real-life frustrations we can relate to. I’m sure you could add to this list. What would you like to see people avoid on Facebook?